Includes two sets of controls for friendly co-pilots. Wheelchair-accessible at ground level. 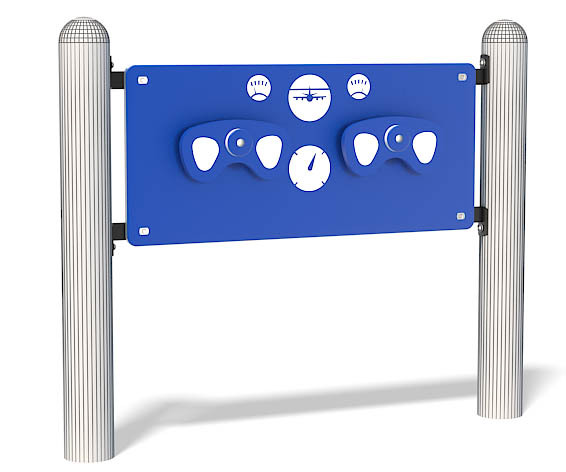 Mini Airplane Panel is a mechanical assembly of panel brackets, panel, and steering wheels. Panel brackets are a welded assembly of 0.1875” x 1.75” (5mm x 44mm) zinc-plated hot-rolled mild flat steel. Panel brackets are powder-coat painted. Panel is 0.75” (19mm) bi-color sheet polyethylene. Steering wheels are 0.75” (19mm) bi-color sheet polyethylene.